Nestled between Miami and Ft. Lauderdale, Hollywood, Florida is known for its beautiful stretch of beach, perfect for a beach vacation. With oceanfront hotels and resorts, you will find the perfect accommodation for a weekend getaway or staycation. You can find unique shopping, beachfront restaurants and bars along Hollywood’s Broadwalk, in addition to year long activities and live music. Nearby down Hollywood Boulevard you will find historic Downtown Hollywood. The growing arts and culture hub includes grand murals, art installments, galleries and the unique ArtsPark at Young Circle, which hosts weekly activities for families, foodies, art enthusiasts, locals and visitors alike. Looking for delicious food and nightlife? Downtown Hollywood has various options for any budget and taste. Convenient trolley service is available to take you to and from Hollywood Beach to Downtown Hollywood to make it easy for you to get out experience everything the city has to offer. 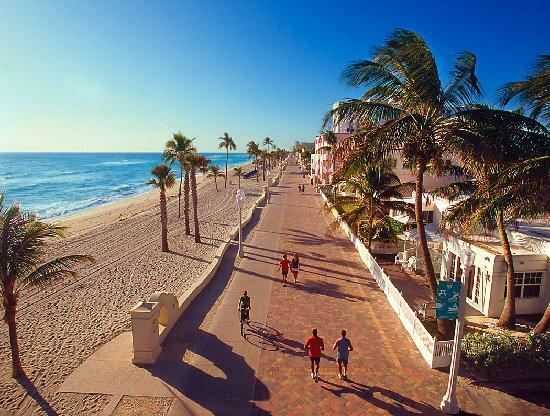 From the sand to the city, you’ll love what you find in Hollywood, FL.